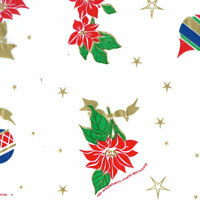 Poinsettias and Ornaments Cellophane Roll 24 inches wide x 50 ft long. Poinsettias are red with gold centers. Leaves on flowers are green with gold outlines. Ornaments are red, green, gold and blue. Cello background has random placed gold stars. All white areas shown are clear cellophane. What a beautiful cello make a statement by using it to wrap gift baskets, presents, boxes, use it as a disposable table runner and much more.